This is your chance to see the fruits of South African Railways' dynamic steam preservation program as a host of locomotives journey to the myriad recesses of this spell-binding railroad system. A symphony in steam that you'll enjoy over and over again as we journey through magnificent mountain scenery. We witness main line and branch line action, doubleheaders, pushers, multiple switchbacks, mixed and passenger service, 4-8-2's, 4-8-0's, ancient and modern Beyer-Garratts and more. Also enjoy some of the most dramatic, long-shot runbys you will ever see. This is an absolute, must-own video for those who love steam racing through and fighting rugged country. Filmed on a photographers’ charter special. Produced by Goodheart Productions. 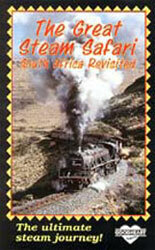 Plus "The Great Steam Safari, South Africa Revisited" offers some of the most dramatic long-shot runbys you will ever see! Trust us...this is an absolute must-own video for those who love steam racing through and fighting rugged country.